Tuesday marked the start of Asian American and Pacific Islander Heritage Month, an annual celebration of the pan-Asian community at Dartmouth that spans the month of May. The new name of the celebration and the theme — “Counter Currents: Beyond the Surface” — highlight an effort to bring more awareness to underrepresented Asian-American and Pacific Islander communities. The format, programming and theme for the annual celebration were developed by a committee of students over the previous winter term with guidance from the Office of Pluralism and Leadership, according to an email statement from assistant dean and pan-Asian student advisor Shiella Cervantes. The student committee is made up of about 15 students and is divided into three subcommittees — finance, marketing and programming — that work together to bring life to AAPIHM, according to Vincent Chang ’21, a member of the finance subcommittee. Chang said that one of the goals for AAPIHM this year is “to highlight Asian and Pacific Islanders who are less represented in stereotypical thinking of what being Asian is supposed to mean.” Chang added that East Asian cultures, such as Chinese, Japanese or Korean cultures, are commonly seen as representative of all Asian cultures. He said he hopes that AAPIHM will help others see the wider range of identities and groups that fall under the umbrella of the pan-Asian community. The theme “Counter Currents” reflects a deliberate effort to highlight those often underrepresented groups and their intersectionality, which is further reflected in the fact that the month of celebration undertook an official name change this year, according to Mahealani Dupont ’21, a member of the programming subcommittee. This celebratory month has historically been referred to as Asian Pacific American Heritage Month, and Dupont said that one of the reasons that she got involved in planning AAPIHM this year was to try and help the Pacific Islander community gain more recognition in both the pan-Asian and larger Dartmouth communities. “As a Pacific Islander so far away from home — literally an ocean away — I think it’s really important to have a sense of community [here at Dartmouth],” Dupont said. She noted that it has been rewarding to see the increased inclusivity of Pacific Islanders in the pan-Asian community through the name change from APAHM to AAPIHM and events like the Hokupa’a Lu’au, which was held last weekend in Collis Commonground. “Putting together a program that honors the diversity of the pan-Asian community requires a lot of thoughtfulness, and the student committee has embraced this challenge,” Cervantes wrote. Dupont said that most of the AAPIHM events are proposed and coordinated by a single point person with support from the rest of the committee. She said this allowed for people who were particularly passionate about some aspect of their culture or a specific event to have agency over how it was celebrated. Dupont, for instance, took the lead in planning AAPIHM’s kick-off event which celebrated Lei Day, an annual Hawaiian celebration, she said. Makale Camara ’21 attended the Lei Day event and said that AAPIHM’s events seem like they will make learning about unfamiliar cultures more accessible to the Dartmouth community. “[These events] are a good place to learn to respect and appreciate other people’s heritage without appropriating it,” Camara said. Chang said one of the most rewarding parts of his experience in planning the AAPIHM events was hearing back from potential funding sources — such as the Special Programs and Events Committee, the president’s office and various academic departments — and learning that they were supporting and contributing to AAPIHM. 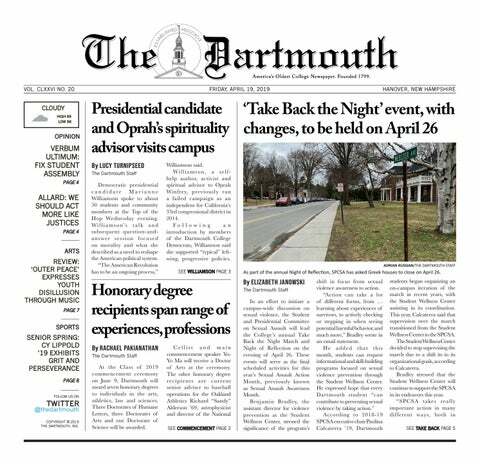 He added that the first AAPIHM events were relatively well-attended and that he hopes more of the Dartmouth community will continue to connect with AAPIHM as the month goes on. AAPIHM events will continue throughout the rest of the month. Some of the upcoming events include South Asian Culture Night on May 5, Dartmouth Taiwanese Association Meet & Greet on May 11, Korean Culture Night on May 24 and the annual gala on May 26. The full calendar is available on the Asian American and Pacific Islander Heritage Month at Dartmouth Facebook page and was also emailed out to campus.